No one wants to be stuck for hours waiting on a loan decision! If you bring all your information to Smart Auto and you don’t hear a loan decision within 30 minutes, we will give you a FREE $50 gas card for your time. We know there are other ways you want to spend your money! 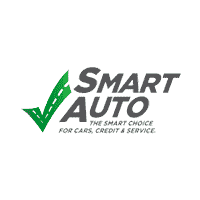 Save money by shopping at Smart Auto with our low down payment options. We want you to be happy with your purchase! If you don’t love your vehicle, return it within 3 days and we’ll exchange it for one of similar value. Drive confidently knowing you’re covered by Smart Auto’s 24 month/24,000 mile limited warranty. If something happens to your vehicle, we’ve got you covered. Smart Auto won’t leave you stranded! We will tow you up to 75 miles for FREE to your local Smart Auto to get the problem fixed. Must be in-store to redeem. The thirty-minute countdown begins when all required underwriting documentation is submitted to a Smart Auto sales associate. If a loan decision is not provided within 30 minutes of document submission, Smart Auto will give you a $50 Gas Card, redeemable at Pilot Flying J or Shell gas station locations. Offer is only available to individuals who intend to purchase a vehicle at Smart Auto and obtain financing through Smart Finance. Low down payment options are available and are based on income, vehicle sales price, and with approved credit. If you are not completely satisfied with your vehicle purchase, Smart Auto will exchange the vehicle for one of similar value within three days of your purchase. Exchange subject to status of vehicles in stock. Vehicle must be returned in the same condition as received at delivery. Ask a sales manager for details. See Warranty Agreement details for complete coverage information. Excludes Value program vehicles. Ask a sales manager for details. Local Towing includes 75 miles of towing to our dealership. Mileage is determined by Google Maps. Local Towing is provided by a third party not affiliated with Smart Auto. Local towing service is available only during the term of the auto financing agreement. Smart Auto reserves the right, periodically or at any time, to modify or discontinue Local Towing services. Smart Auto is under no obligation to support or provide a specific towing company and/or provider.